Sometimes bees make their homes in unexpected places. When a hive swarms, as Mom discusses in her Swarming in Maine post, scout bees go out and look for a hollow place, like a tree trunk or log. The suburban bees who made the comb pictured above may have swarmed from a neighbor’s hive and found this covered grill for lack of forests. This photo shows how bees build their comb when they aren’t supplied with a man-made frame and sheets of beeswax foundation. In a Langstroth hive, which is the design I use, frames are lined up next to each to mimic this vertically-hanging natural design. The man-made frames regulate the width of each comb and the space between each comb, called bee space. The point of the Langstroth design is to encourage the bees to make more honey for the beekeeper to harvest, but you can see above that bees certainly don’t need any frames or foundation to build strong, healthy comb. 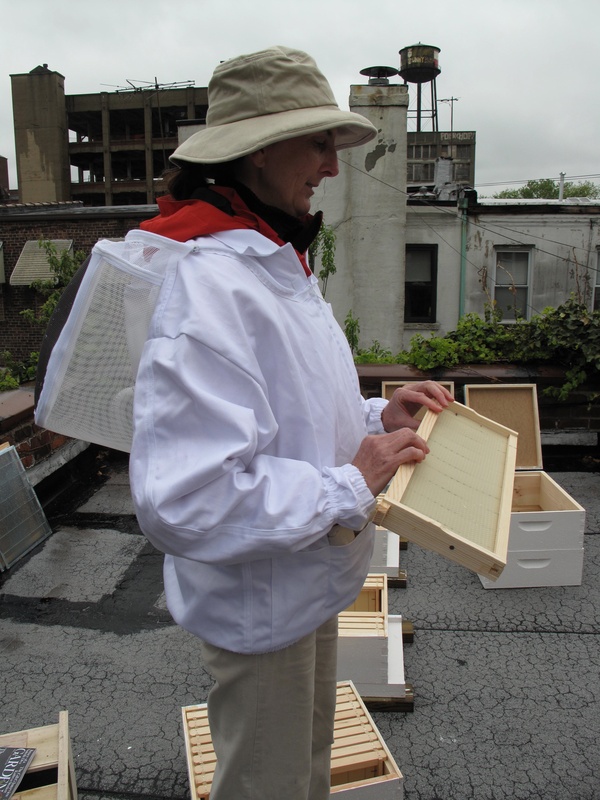 Naturalist beekeepers like Michael Bush advocate foundationless beekeeping, which is when you use the frame but not the sheet of beeswax. He and others say that bees actually draw out comb faster when there is no pre-existing wax for them to build upon. The comb the bees naturally draw out has other advantages– like the size of each cell is exactly to the bee’s needs and liking instead of each cell being pre-designed by a man-made press. If you forget what beeswax foundation looks like, see Mom holding some here. I like the idea of foundationless beekeeping, but when I asked my teacher about it he said that burr comb would be my enemy. Burr comb is erratic comb that messes up the order of your hive and makes it hard to work with the frames and to extract the honey.